A Nurse wished to have a caduceus for her. Something bold and could pack a wallop. the classic caduceus symbol of wings framing a pair of serpents climbing the staff of Hermes. In Roman mythology it is a staff carried by Mercury the messenger. two realms in which balanced exchange and reciprocity are recognized as ideals. In North America associated with Medicine and Health Care. 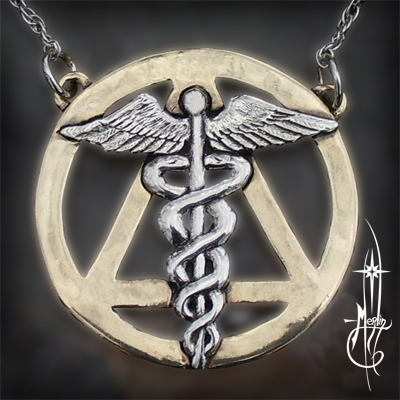 The classic symbol of the caduceus over the Elemental symbol of Fire. two inches on a sterling rope chain. The original piece is now in a private collection. If you wish something similar, please visit my How to order Custom page.